Marmoleum flooring is gaining a commendable response from home owners given the fact that it is an eco-friendly flooring option. The fact that it is environmentally friendly makes it an appealing option for customers. 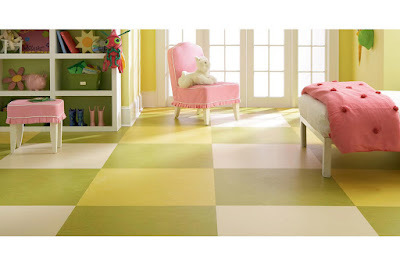 Marmoleum floors are an ideal option to other kinds of traditional flooring such as vinyl flooring. Most designers are choosing Marmoleum floors given its durability, pliability and the ease in installation. Before you think of choosing Marmoleum as your flooring option there are some do’s and don’ts that one should follow. Given below are some maintenance tips that need to be taken care of. It is best if it is installed by an experienced professional. Never use a steam cleaner to clean the floors. As it is easily scratched or dented, always place pads under the furniture while moving and never walk with high heels as it can cause damage to the floors. Any flooring has its own set of pros and cons. Firstly one has to figure out if it is suitable for your family. Firstly it is made of natural materials and does not emit any toxic gases or have any chemical deposits. Marmoleum floors are flexible and can be used to plan intricate designs on your floors. The floors are anti bacterial, which means germs don’t spread. These floors also reduce dust mites and can help in eliminating various allergies. The floors are very comfortable to walk on and it won’t be a problem if one has to stand on them for long stretches of time. They are 100% recyclable and no Volatile Organic Compound will be present. These floors stain, dent and scratch easily. Constant attention is necessary to maintain these floors. The finish of the floors can get damaged easily. It is an expensive flooring type. Before choosing any particular floor, one should think about the pros and cons and see what best suits you. For instance, if you cook a lot, then Marmoleum floors may not be the right choice as it can stain easily and if you use chemicals it can damage the floors. If you are having pets, then Marmoleum floors may not be the right choice. Each and every kind of flooring has its own set of problems and benefits. Marmoleum floors can work for some people and for others they might realise that they have made a grave mistake by choosing this kind of floors. Whatever the choice maybe, it is best to go through the reviews and choose what suits best for your lifestyle. your information is really awesome as well as it is very excellent and i got more interesting information from your blog. Deck Coatings at best price. Innovative polycoats is deck coating service provider in pune. Deck Coatings service, Deck Coatings service provider in India.